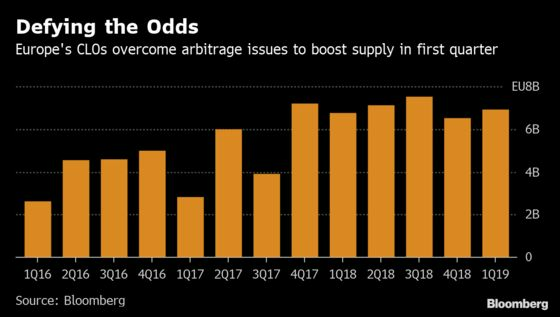 (Bloomberg) -- Europe’s CLO market defied expectations last quarter to price nearly 7 billion euros ($7.9 billion) of new transactions, the fourth highest quarterly volume in the post crisis era. The rush of issuance meant that banks were able to offload a large chunk of the uneconomical loans that have clogged their balance sheets since late 2018. That bodes well for the second quarter, and there are at least eight managers eyeing deals. But what’s really needed to improve the arbitrage is less supply, or at least more demand from investors. Facing tough arbitrage dynamics, and with new and unfinished regulations to adhere to, the market also had to grapple with patchy loan supply, forcing managers and arrangers to innovate structures, as well as to sacrifice fees to boost returns to equity investors. "At the start of the year there were three possibilities for managers. Wait for CLO spreads to tighten, liquidate the warehouse, or bring the deal to market, cut fees, take on more equity themselves and enhance structures," said Alexander Ohl, portfolio manager at Union Investment. It’s clear from the levels of supply that managers chose to forge ahead, doing what they could to shift deals. Those able to tap into an anchor investor on the top-rated AAA tranche and an in-house retention fund for their equity had a clear advantage. A rallying secondary market also helped, bringing previously underwater warehouses back in the money. And arrangers rolled out structural tweaks, ranging from short-dated structures to tap into better demand from that investor base given the later stage of the cycle, to stripping out the most expensive single-B tranche to reduce funding costs. These methods went some way to entice equity investors into deals, but they also alienated some debt investors due to deterioration in ratings in the lower mezzanine debt tranches. But Hayfin bucked that trend with a rare ‘flat rated’ deal during the quarter. "The CLO market proves itself to be creative at finding structural solutions to get deals done in a tough market," said Chris McGarry, partner at law firm White & Case in London. Going into the second quarter, managers hope loan spreads will be substantial enough, and asset supply strong enough to maintain pricing discipline. While loan issuance picked up as the quarter progressed, it is still down about 24 percent on the previous year. Managers opening new warehouses say they are looking to include assets priced at 400 basis points and higher, to balance against funding costs in the low 200 basis points area. Companies issuing in the single B bracket paid an all-in spread of about 420 basis points to raise first-lien euro loans in the first quarter, but loan margins still vary widely among credits. 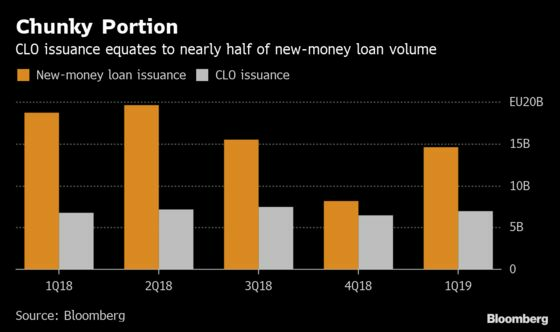 Depending on the pace of loan issuance, CLO managers may be forced to take their time ramping new deals. That might not be such a bad thing some managers say, if slower formation helps restore the arbitrage dynamics more quickly. On the demand side, liability spreads are wider than they have been since 2016, which in theory could attract debt investors. Japan has defined the bid at the top of the stack so far this year, and shows no sign of stepping back, with its pipeline stretching out to the summer, managers say. But the depth of demand from other AAA investors has not been fully established. What is needed, said one investor, are several really well established managers to tap into the non-Japanese bid to test its strength. The syndicated bid is better than it was in January, although still worse than January 2018, said one European arranger. Further down the stack, and on the back of a broader recovery in corporate debt, stronger demand in secondary for the lower rated ’mezzanine’ debt has provided support for new issue spreads in recent weeks. "CLOs still look cheap versus mainstream credit, it should have more room to tighten from these levels and further tiering between managers, ratings and vintages is a good development," notes TwentyFour Asset Managers’ Aza Teeuwen in a note.